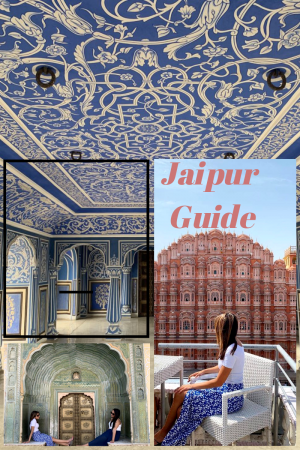 Rajasthan is known for its enchanting palaces and impressive forts and when we were planning our trip to India, Rambagh Palace, which is a Heritage hotel managed by Taj Hotels, was top of our list for Jaipur. 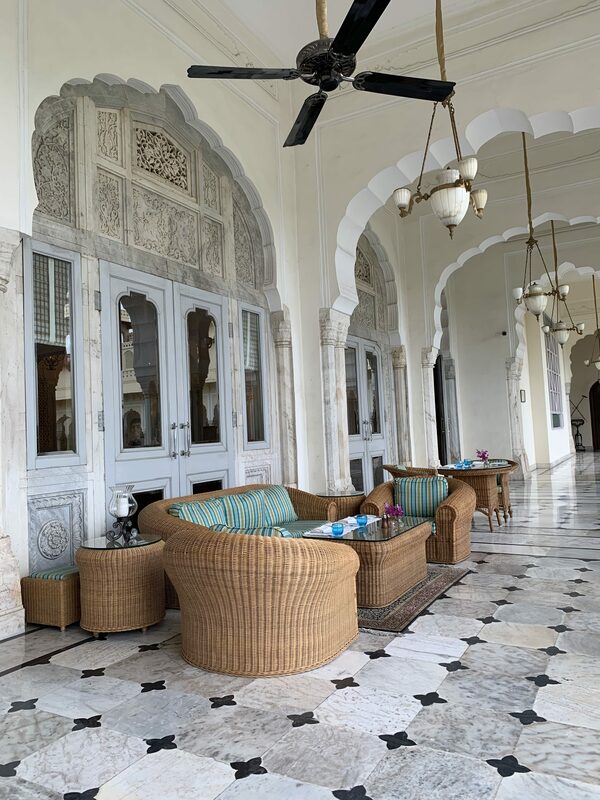 This beautifully restored palace, which was built in 1835, has a rich history of royal transitions from being the queen’s favourite maiden’s home, a hunting lodge to the residence of Maharaja Man Singh II and his stunning wife Gayatri Devi in 1925. It is now a luxury 5 star (feels like 7) hotel and was a real ‘pinch me moment to stay here as well as a tick of the bucket list to stay in a former palace! It also has a great central location, another reason why it was our choice, and is minutes from Sawai Mansingh Stadium (great if you are a cricket fan) and Birla Temple. 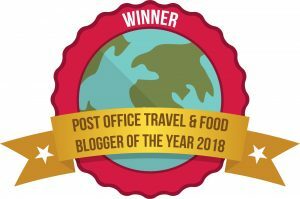 It was fully paid for by ourselves and so I was under no obligation to write a review but I had such an incredible stay I wanted to! 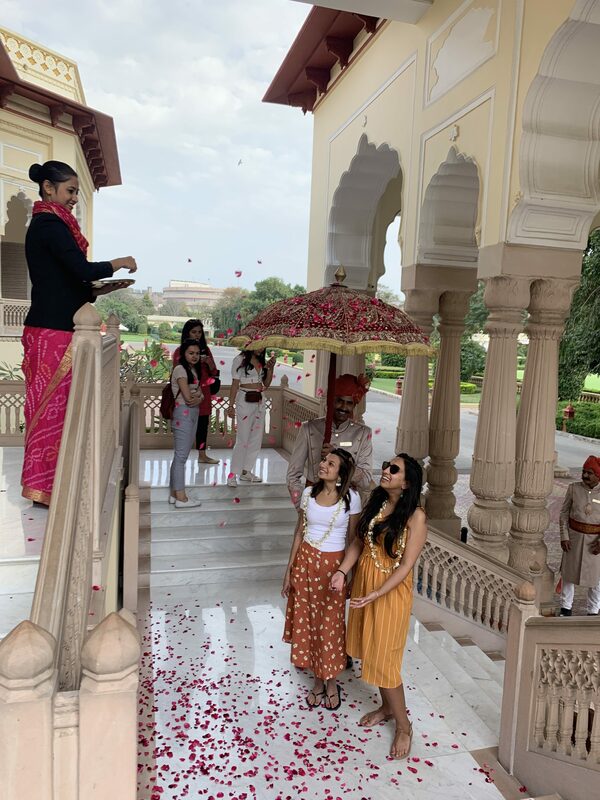 On arrival, we were showered by rose petals and treated like Maharanis. What a welcome fit for a queen! We knew from this point that we had chosen wisely, and it was worth every penny. 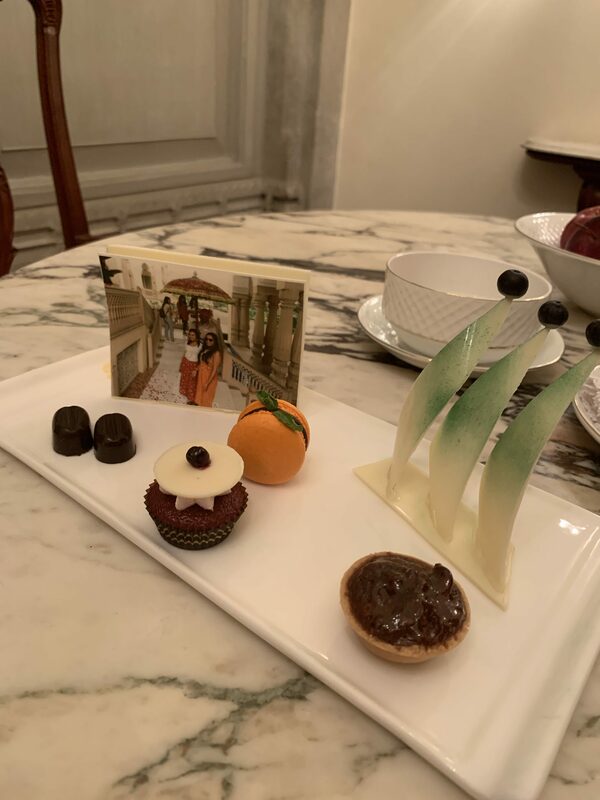 Service at Rambagh Palace is extraordinary and little known to us a sneaky pic was taken when we arrived which was then printed on edible paper and presented to us in our room along with a decadent selection of sweet treats. What a lovely gesture! During our check in process we were grateful to have discovered that we had been upgraded to a Historical Bedroom Suite which opened up to perfectly manicured gardens. 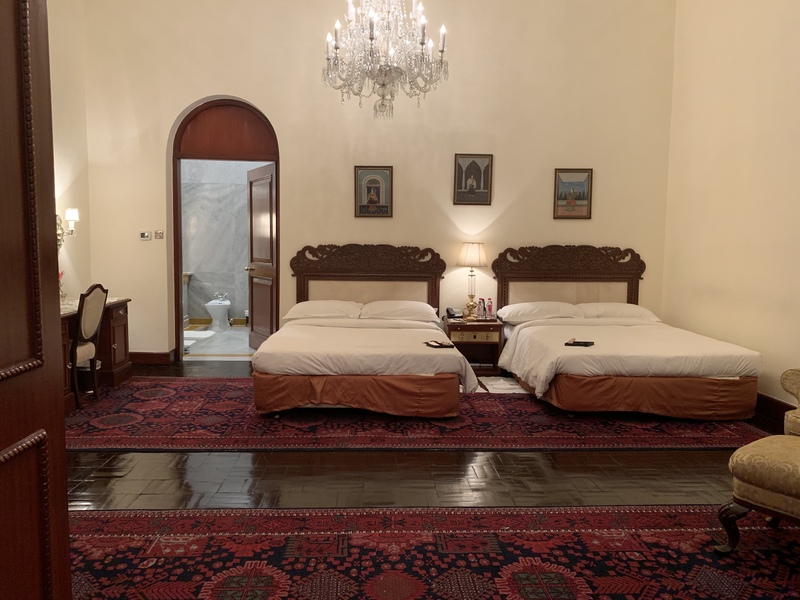 Despite its epic scale, there are 78 rooms, including 33 suites, at Rambagh Palace, which means that you get to have corners to yourself even at peak capacity! Our beautiful room was adorned with Rajasthani artwork and had the perfect balance of being large and spacious as well as invoking a cozy atmosphere. As you walked into the room there was a dining table and a lounge area, which then opened up into the bedroom, which had twin beds for us. They weren’t just ordinary twin beds either – they were HUGE. 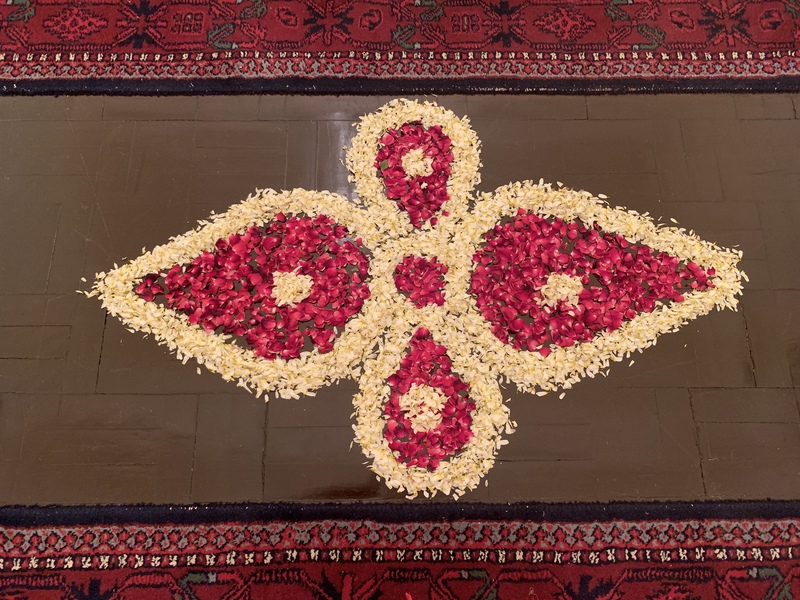 The amazing gestures continued whilst we were wandering around the property and we came back to find this gorgeous flower rangoli in our room, filling the air with a delicate scent of roses. 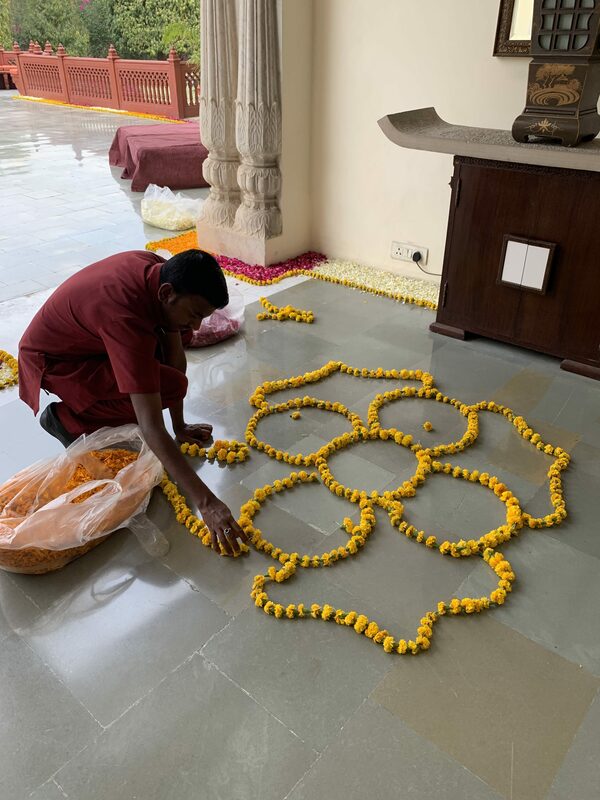 We had actually seen some beautiful Rangoli being prepared as we were given a tour of the property. 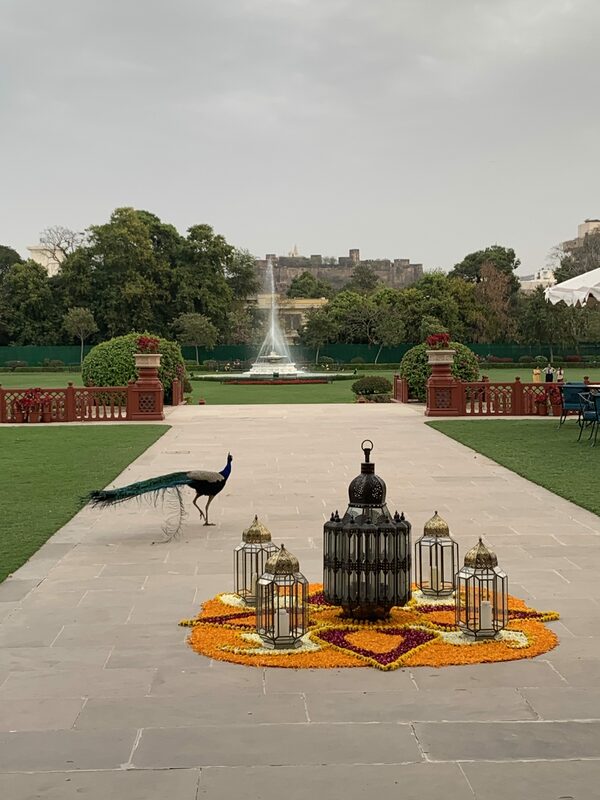 The grounds of Rambagh Palace (47 acres of it) are absolutely stunning with perfectly manicured gardens and beautiful Indian architecture all around. 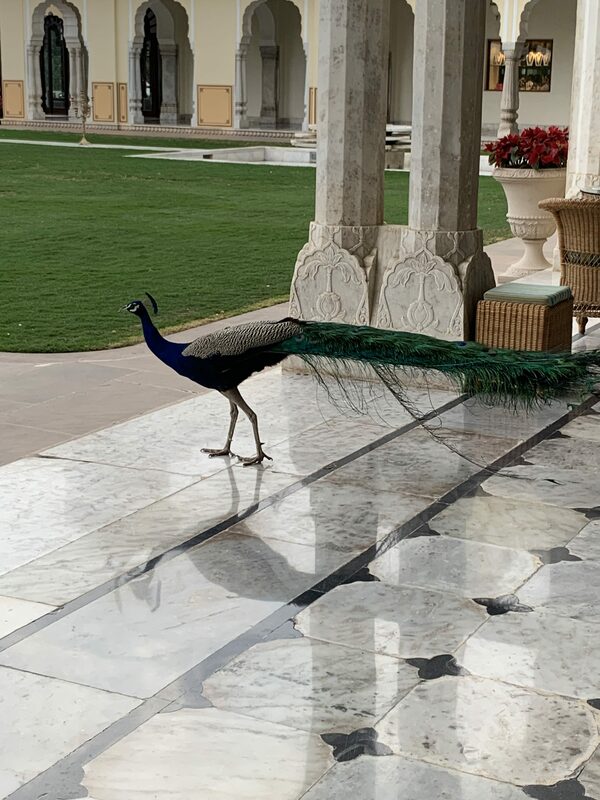 They have over 100 resident Peacocks at Rambagh Palace, who you will be sure to see, and if you’re lucky you may even see them dance. 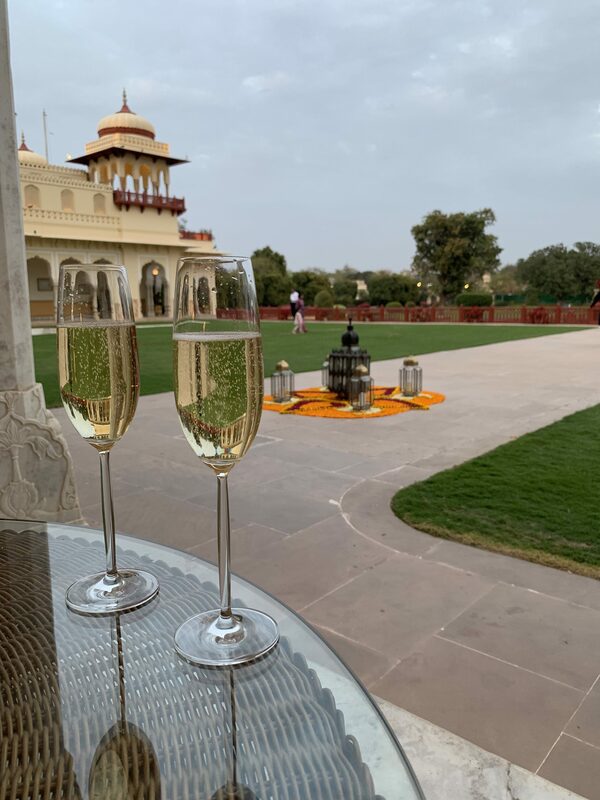 After we had settled in we enjoyed a glass of Champagne at the Verandah whilst we watched the sun set as well as a wonderful dance performance. All guests are invited each evening to take part in a candle-lighting ceremony which is also so lovely. The Verandah cafe is such a lovely spot and you can also have your breakfast here or opt for Afternoon Tea for something more indulgent. 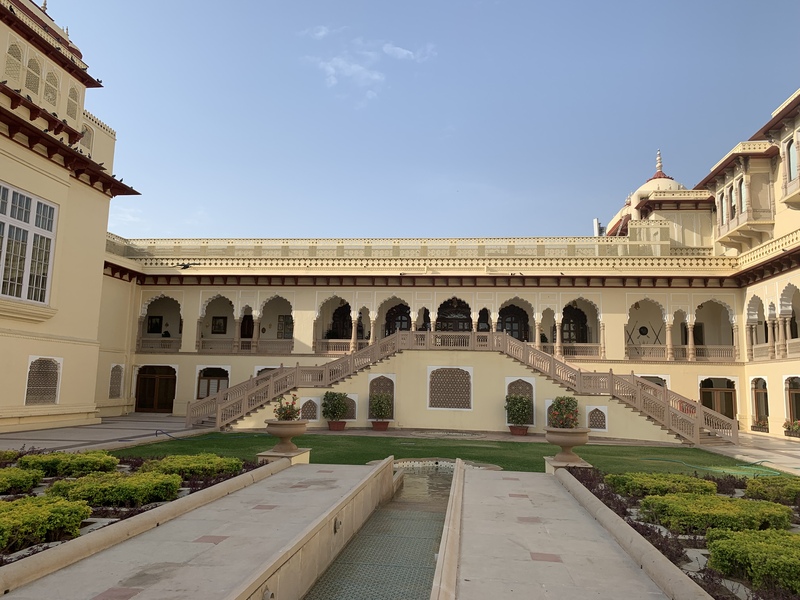 There are such amazing dining options and we decided to have the Rajasthani Royal Palace Thali, which is a tasting menu, at Suvarna Mahal, Rambagh Palace’s grand dining hall. This was once the royal family’s banqueting room and is adorned with opulent furnishings and gold plated table settings! 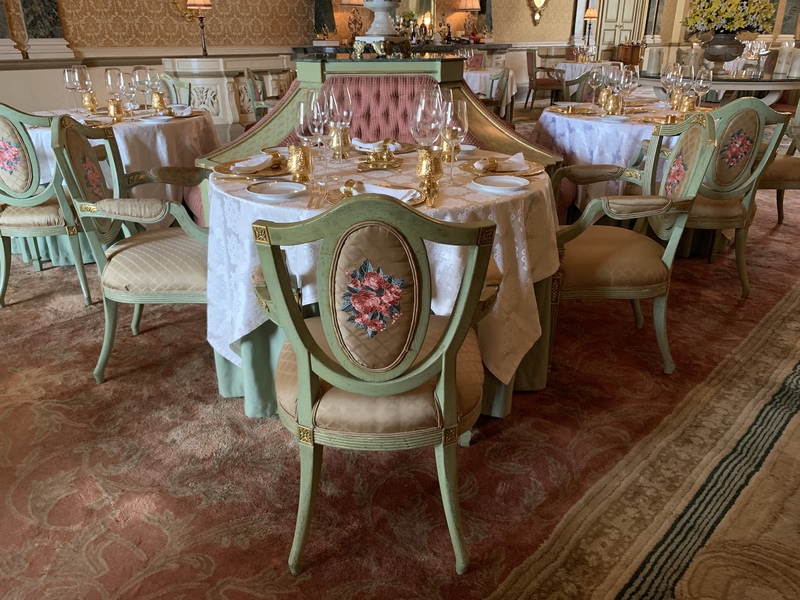 The dining room is absolutely beautiful with high ceilings, gilded mirrors and Florentine frescoes, providing the perfect ambience for an evening of fine dining. They do the best Laal Maas, a Rajasthani speciality. After dinner be sure to nip into the Polo Bar for a nightcap! The stunning bar captures the spirit of the equestrian sport, much loved by the royals, with memorabilia and trophies. 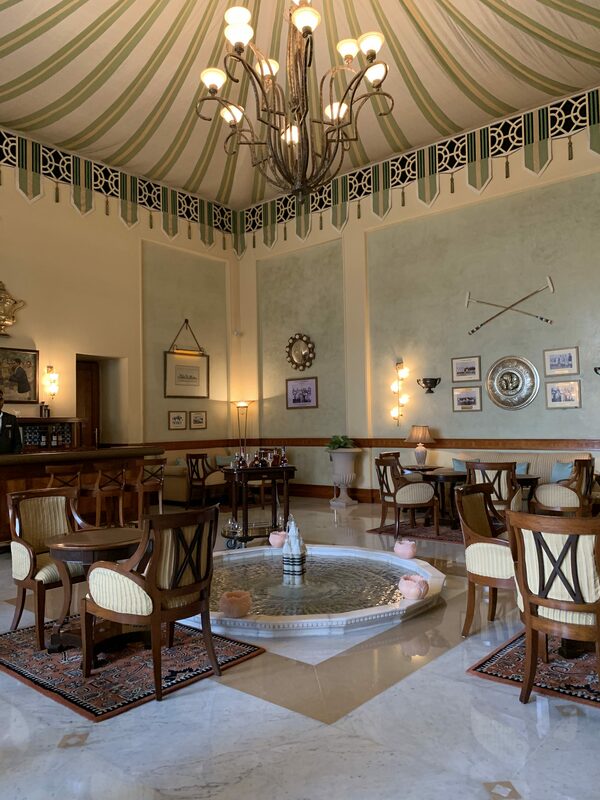 After waking up to the soothing sound of a flute being played in the patio outside our room, we had breakfast in the Rajput Room, an all-day-dining restaurant ideal for breakfast, light bites, French press coffees and fresh teas. 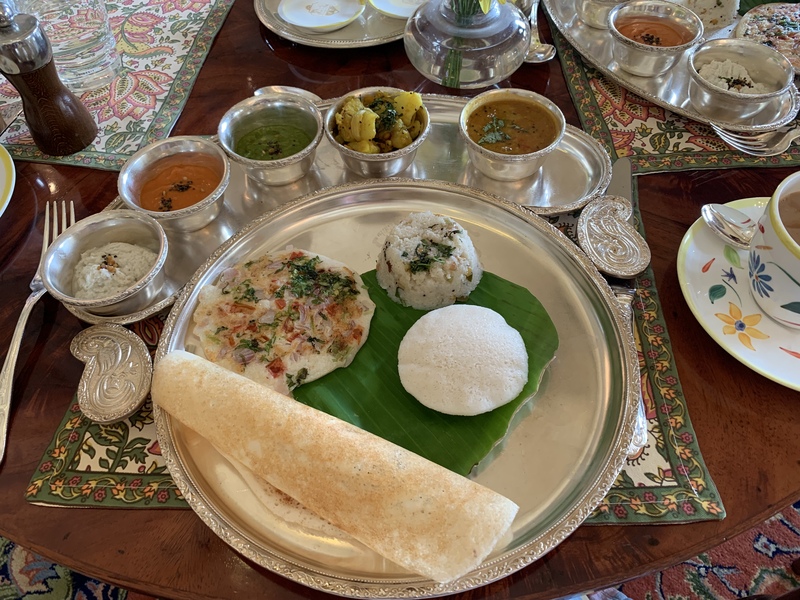 Highly recommend the South Indian Platter for breakfast – it was just incredible! Whilst we were waiting they also brought over some freshly basked croissants with rose for us to try and I may never be able to eat an equally amazing croissant ever again! 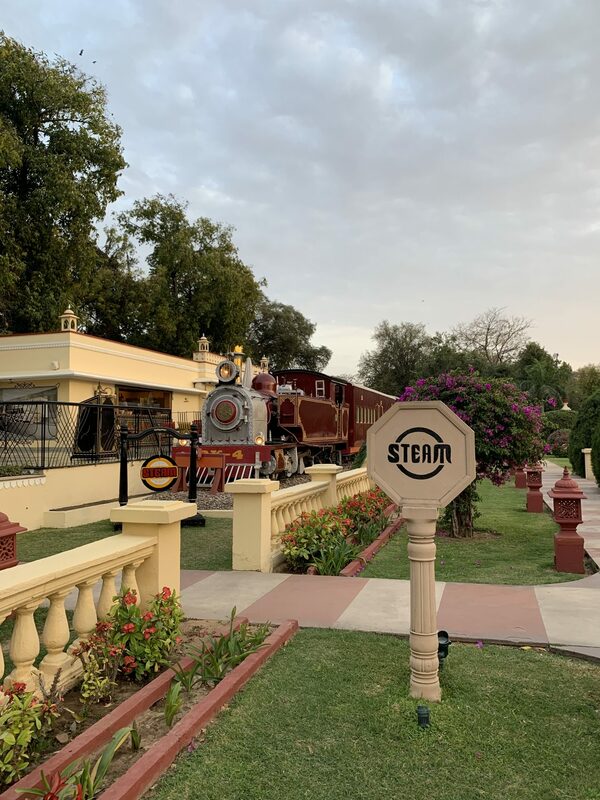 A reason for me to come back is to try their Steam restaurant next time, which has been highly recommended in lots of press, and is a recreated Steam engine restored from the colonial period. 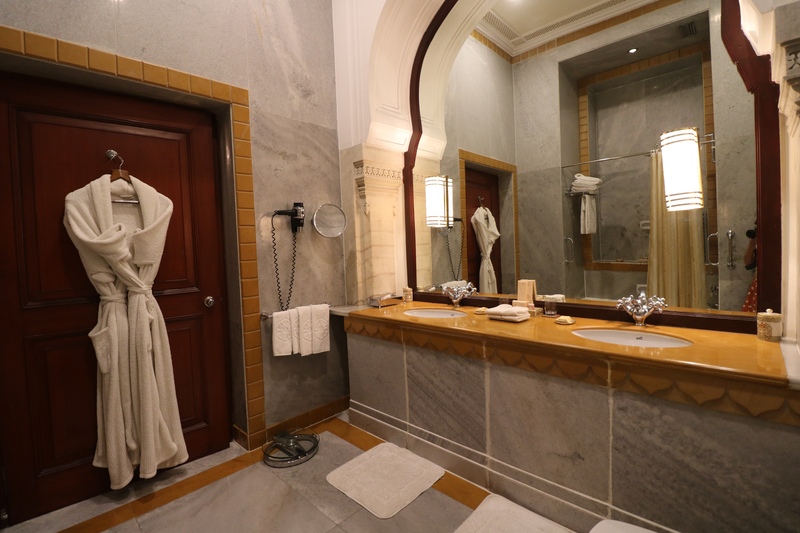 Making the most of our time at Rambagh Palace, we treated ourselves to blow dries at the hotel’s spa complex, which has an amazing indoor pool, outdoor pool, whirlpool, steam rooms and saunas, and a great variety of treatments. 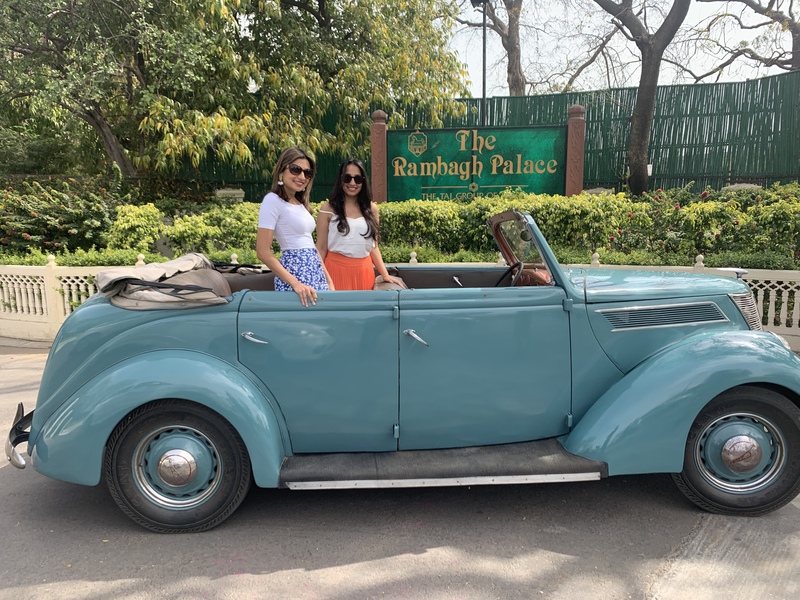 During our stay one of the biggest treats was seeing their amazing collection of Vintage Cars and being able to go for a drive around the grounds in one of the classics! The hotel recognised how much fun we had and actually organised another surprise drive in the car when we were departing which was so sweet of them! 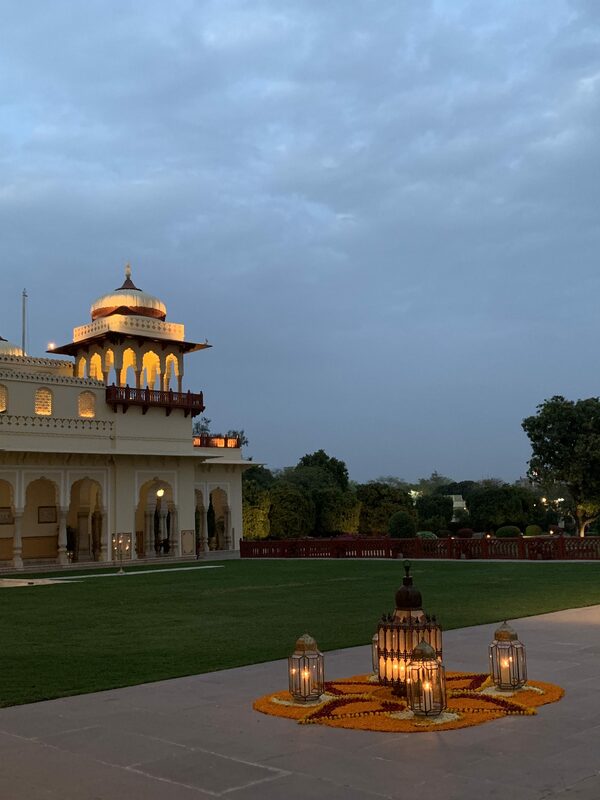 It was all these meaningful gestures, combined with the history, heritage and flawless service which added to the tears we had running down our faces when we had to leave our Princess lifestyle behind at Rambagh Palace, as we were truly treated like royalty and felt like we had lived our best lives in a palace. Although on the pricier end of the spectrum, if you want somewhere truly special, I can’t recommend Rambagh Palace enough. 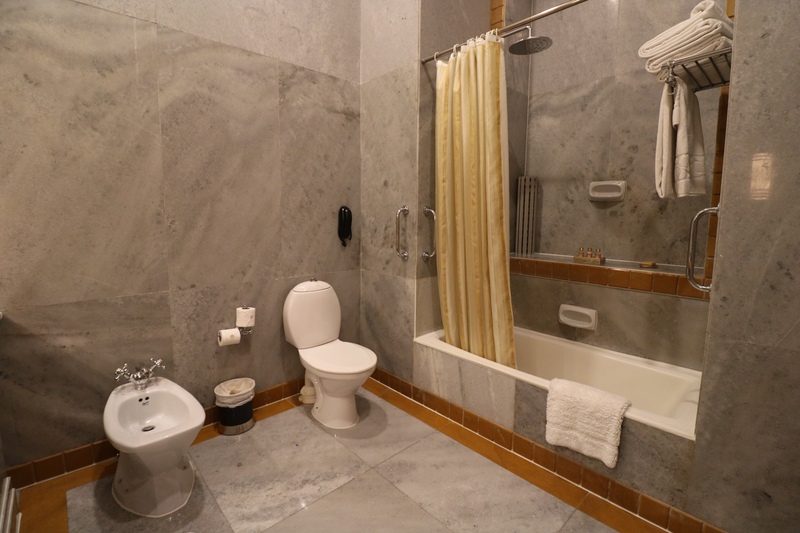 From the minute you arrive to the minute you leave its charming grounds, you will get a true taste of how it’s like to live like Royalty in its palatial wonder! Combined with the hospitality Taj Hotels are renowned for, it will be a stay you will remember for a lifetime. This has to be my favourite hotel you’ve ever stayed in. The attention to detail is phenomenal. Amazing Binny…from the architecture, THE CAR and the picture of you both on your sweet treat tray. 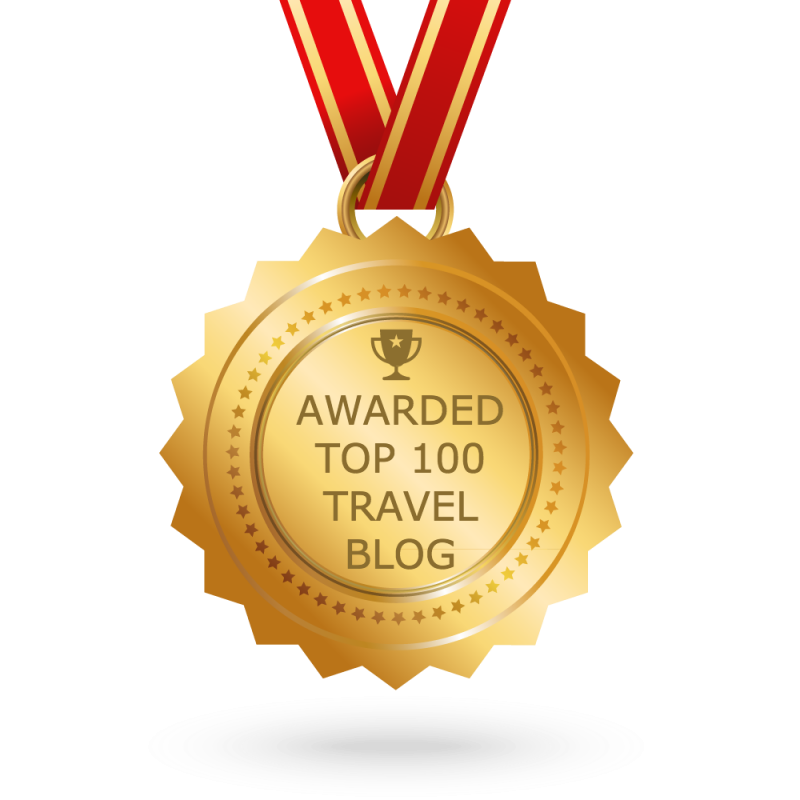 A hotel you’ll remember forever! What an incredible hotel! It looks absolutely stunning! I bet you didn’t want to leave!